Koloa, Kauai: Located along Kauai's south shore, the small town of Koloa is a popular attraction as the site of Hawaii's oldest sugar plantation. Founded in 1835, the town has some of the oldest buildings in the state. You can explore the remains of the old sugar mill, or just stroll down Old Town Koloa and enjoy the town's remodeled shops, galleries, restaurants, and history center under a canopy of native monkey pod trees. 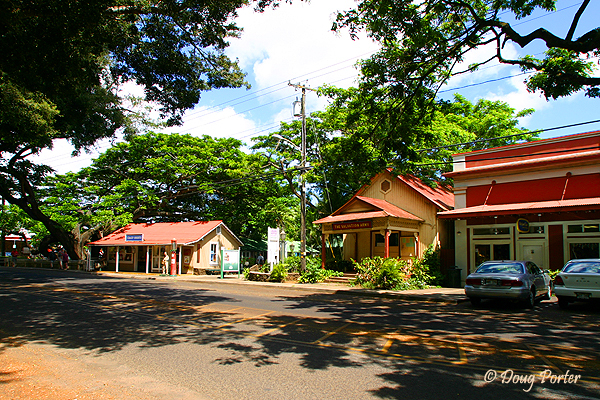 Every July, the town celebrates Koloa Plantation Days, which features a parade, fair, music, games, and storytelling. Nearby recreational activities are just minutes away and include hiking, fishing, sailing, snorkeling, swimming, surfing, and scuba diving. Several Kauai golf courses are nearby including the famous Poipu Bay Golf Club (Past home of the PGA Grand Slam of Golf from 1994-2006) and also Kiahuna Golf Club. Koloa is situated just 12 miles away from the Lihue Airport. To get there, take Highway 50 south towards Poipu. After about 7 miles, turn left on Highway 520 through Kauai's famous tree tunnel. In just over 3 miles, take a right on Koloa Road, which takes you straight into town. It is just a short drive from Koloa to Poipu Beach, and popular vacation accommodations at Kuhio Shores, Prince Kuhio and other south shore Kauai vacation rentals.